In the last decade, anyone involved with the game of baseball wanted performance-enhancing drugs (PED) banished from the game. PEDs are now (hopefully) at a minimum in the game, but drug testing and harsh penalties weren’t necessary. Why not go right to the source of the problem? Why did most batters take PEDs? They took PEDs to hit more home runs, which brought more people to the ballpark, which made the owners richer, which made the players richer. Why did most pitchers take PEDs? They took PEDs to prevent the home run, which sometimes worked and sometimes made the home runs travel even farther which brought more people to the ballpark, which made the … you get the idea. When do real baseball fans truly enjoy the home run? They enjoy it when it benefits their team. When fans watch a random minor league game or one on TV between the Padres and Giants, they don’t want to see home runs. They want action and suspense. Home runs have little action or suspense. They’re over as soon as they begin. The single, double and triple provide action. There are plays at bases. There are fielders fielding, running and throwing. There are base coaches waving their arms. Umpires are scattering to get into position. Decisions need to be made. Drama and suspense ensues. Here’s the pitch … Jackson pulls it deep to right! It’s gone! With Spinler leading off second, here’s the pitch … Jackson slaps it the opposite way to left! Spinler’s on his horse and he’s being waved home! The throw from Karels goes home! Spinler slides and heeeee’s … safe! Jackson is going for the extra base at second! The throw from Olson and Jackson slides safely into scoring position with two out! Which one was more exciting? It was the single – the f***ing single. One base is more exciting than four. Of course, there might not be anything more exciting than an inside-the-park home run, but thanks to short outfield fences, those are few and far between. The home run has been cool for four periods of baseball history. The first was Babe Ruth’s career. When The Babe started belting balls over the fences, the audience’s reaction was probably similar to the first alley-oops in basketball. 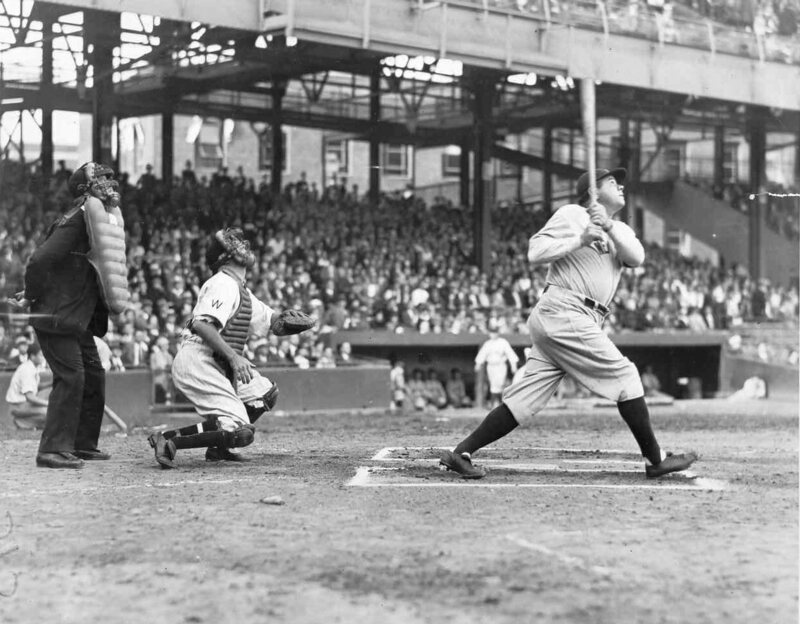 Many people didn’t come to the ballpark to see their team win, they came to see The Babe knock a home run 500 feet. This is, by far, the longest period the home run should be applauded. The other three periods last for only one season. When the home run was new and cool. The next was 1961 when Mickey Mantle and Roger Maris battled to break Babe Ruth’s 1927 single-season total of 60. The nation wanted Mantle to break it. Instead, it got the quiet, sometimes grumpy North Dakota kid, Maris. Little did the nation know this was just foreshadowing for 2001. In 1974, amid threatening racist letters and horrible home attendance, Hank Aaron broke Ruth’s all-time record of 714. If you weren’t a dumb redneck, you were rooting for one of the greatest and most consistent players to break the former Boston Brave’s record. Then there was 1998, the summer of international denial. Mark McGwire and Sammy Sosa, who looked like Hans and Franz, trashed Maris’s single-season record with 70 and 66 long bombs, respectively. Every baseball fan was captivated by the same two men they’d be cursing in less than a decade. The home run really hasn’t been consistently cool since Babe Ruth retired. It was cute back then. It has worn out its welcome. It is cowardly and takes away from the game. As soon as the one-trick ponies of Dave Kingman, Jose Canseco, Mark McGwire and Sammy Sosa stepped up, the game of baseball was no longer a game but a contest. Even new parks were built to accommodate the home run. The ball was likely juiced as were the players. The combination of steroids, small parks, juiced balls, amphetamines and Sportscenter all added to the home run totals. Okay, they were fun in 1998, but soon enough they became annoying thanks to the solo home run in the ninth inning with two outs down by six runs, Chris Berman’s “Back! Back! Back!” commentary, the home-run line at Enron Field, the right-field wall at Yankee Stadium, and Sammy Sosa’s boombox. How fascinating is the home run if three players can hit over 60 of them in one season over the course of four seasons? If its single-season records we want to see broken, why not ask for something more challenging? There’s Earl Webb’s doubles record (67), Joe DiMaggio’s hit streak (56), batting .400 (hell, batting .380 would do it for me) and stealing 100 bases. Chicks may dig the long ball, but real women love real baseball. The only “chicks” who dig the long ball are the ones that, sadly, pay more of a ballplayer’s exuberant salary than the real women. The “chicks” are usually drunk before the game starts and continue to buy $8 beers throughout the game while rarely watching the game. When asked who their team is playing, rarely can an answer be pronounced along with the score or starting pitcher. There are three times as many men with the same affliction. There are a few solutions. Ban the home run, or at least moderate them. Allow each team one over-the-fence home run per game. Every other home run after the first is an out with runners not advancing. Is this proposal realistic? No. Unfortunately, with the influx of new ballparks in the last 20 years, there aren’t many teams looking for a new place to play. For the few who are, build your new parks with real baseball excitement in mind. However, many of the new parks like Citi Field, Comerica Park and Target Field are on the right track. A home run is more difficult in these parks more than others thanks to vast outfields and deep power alleys. Players need to earn their home runs. A 314-foot right field fence in Yankee Stadium is not earning a home run. It’s sad the Yankees kept the dimensions the same as the old park when they built the new one. The home run does not impress me. It’s been overdone. It’s overrated. It has lost its magic.